Guest Post by Mr. Shiv Murti, A mentor for most Indian retail professionals! I can remember the first time I saw the site sometime in 2000 1st. Quarter. The site comprised of 2 factory sheds with a road in between and I wondered how we would make a Hypermarket out of it. Many months later the final design came out and when the civil work was completed it was like a transformation of the Ugly duckling. 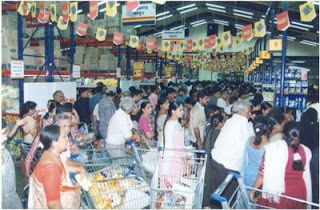 India's first single level Hypermarket was born. The next step was filling it up. 45,000 sq.ft. of store space - a team that was more used to filling up supermarkets of 3,000 sq.ft - new product categories to handle. It was a learning experience and a very enriching one and within 4 months we had the Product Master ready with the space allocations etc. Then the order placement and the drive to fill up the store. We set ourselves an impossible task of 15 days time from first receipt to opening. I remember Kruben saying it normally took 60 days but he had done it in 45 days with a supply chain that worked, vendor supply efficiencies of 90% plus and with experienced staff. We had none of these but we had a team that was willing, eager and did not know the meaning of the word impossible. We were ready 1 hour before the store opening with what even Michael and Kruben admitted was a very high level of store readiness and a store fill of approx 84% of what we had planned as the SKU count. It took passion and an immense drive from everyone concerned to make it possible. And then of course the store opened. And within the first hour we knew it was a runaway success. That was the story of the opening of the first true hypermarket in India and it was all made possible by a very committed team. 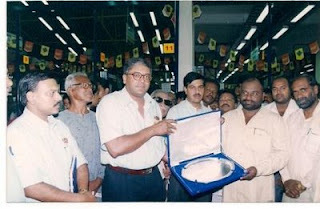 27th June is etched in my memory as one of the most memorable days in my life and also "INDIAN RETAIL HISTORY' a s it marks the arrival of HYPERMARKETS in India. It’s been 8 years since then and the industry has grown by leaps and bounds but the trigger for that was the 27th June 2001. 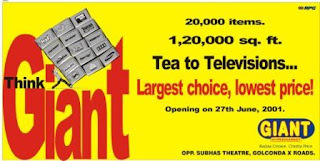 The team had worked relentlessly for 15 days 24 hours a day to ensure that "GIANT" opens on the designated date and I thank the entire team for the support and the ab le guidance of Raghu, Kruben and Shiv who made it possible. Once again let’s celebrate this day by dedicating ourselves for the cause of "INDIAN RETAIL". 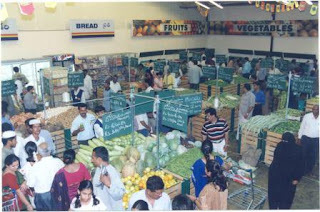 India’s first full fledged hypermarket opened its doors to customers on June 27th 2001 in the twin cities of Hyderabad and Secunderabad. Spread over 1,20,000 sq. ft. site, the store was a first of its kind in the country. Many interesting firsts were tried out in that stor e. Industrial type of racking was used and the upper parts of these fixtures were used for inventory storage. There were more than 15 cash tills, which itself were an awesome sight to see. Not many Indians would have seen this unless they had travelled abroad. Apart from all the products that a supermarket had, there were clothes, consumer durables, etc. I personally was amazed that there were so many products (20,000 SKUs) that a consumer could choose from in the Indian environment. One of the most interesting innovations was the open, wet market type offering of fruits and vegetables. The consistent popularity of the neighbourhood wet market was diminished only partially by the crowded, dirty environment of such places. However, the long standing Indian habit of sifting through and selecting vegetables made consumers overlook the environment. The idea was to offer the same wet market feel of mounds of vegetables that customers could select from, without the dirt and slush usually found in such places. This was an instant hit and nowadays one sees a similar offering in most stores. 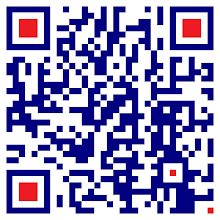 This store was also a fore runner of the Cash & Carry format, which is an exclusive B2B format. 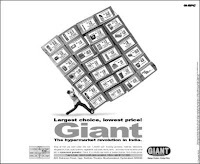 Although ‘Giant’ was a hypermarket catering to end consumers, there were a group of B2B customers who were regulars for the store. A small sales team from the store catered to such B2B customers in terms of their requirements. 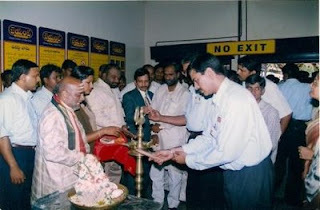 Memorable moments abound with regard to the launch and the most interesting one is the launch promotion on sunflower oil. Oil sells like hot cakes in Hyderabad. As compared to the 3 to 5 litres of oil that most of us purchase every month, many families in the twin cities actually purchase 15 litre cans and also manage to finish it month after month. Therefore, any launch without a special offer on oil would have been incomplete. Now, oil is a commodity and even though we purchase cooking oil in packets, the pricing is influenced by the ruling commodity price. It so happened that the price of oil spike a day before the launch and there was no way we could change the offer so later into the run up to launch. Also, once communicated through advertisements and leaflets there was no way we could not honour the offer and risk losing credibility in the customer’s mind. However, what ended up happening is that a large number of small traders descended onto the store and literally a few seconds after the doors were thrown open, the shelf was wiped clean. 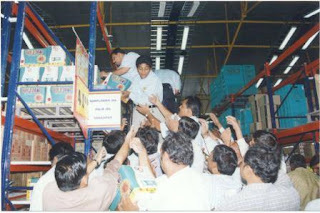 In the picture you can see the mad scramble to grab this product whilst the staff is trying to bring down additional stocks from the storage area. An interesting experience which left behind a huge learning. The practice of reserving the right to limit the quantity purchased by anyone, especially on such highly popular offers was born out of this learning. Offers and promotions are a default part of any value retailer’s life and cannot be wished away from any communication element. 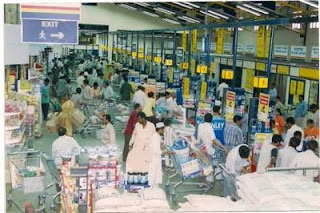 By the time the Giant store was launched RPG Foodworld had established the 365 day promotion as a norm and several other retailers had also started to mimic that. In that context, the challenge was to communicate offers, but come up with a creative idea to communicate the size and scale of the new format in terms of the store itself as also the products available. The risk of being seen as yet another store, especially a supermarket had to be managed as also the concept of a hypermarket had to be established as the term hypermarket itself was completely new to the consumer’s psyche. 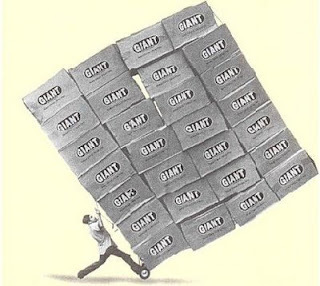 This led to an interesting launch campaign, which leveraged the traditional sight of a person pushing or pulling a large cart laden with things. Coupled with some mind boggling numbers in terms of store size and number of products available, the communication was an instant hit; of course helped along by some very attractive offers. Sharing some visuals from my scrap book for everyone to enjoy; The advertisement, Invitation, etc. Selecting names whether it is for a new born or a new store has similar levels of involvement and effort. So, it was during the run up to the first store launch. Several names were discussed and discarded. 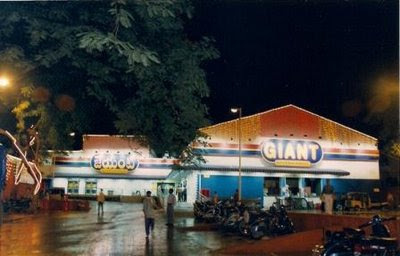 A little known fact was that the team landed on the name big bazaar. The idea was to communicate the largeness of the offering. 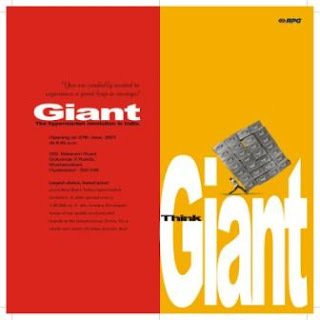 Various designs were discussed and finally a blue, yellow and red colour scheme with the word ‘big’ being the central visual point was agreed upon. Design guides were made and other related communication and design elements were being developed and processed. One fine day there appeared a recruitment advertisement for another yet-to-start chain and lo behold, the name of the proposed chain was big bazaar. The first half of that day was complete pandemonium with everyone trying to figure out how this could have happened and if our application for registration had be en declined for any reason. After much huffing and puffing, it came to light that the matter had slipped between tables by someone, somewhere. 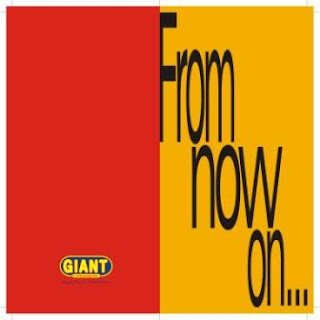 So, the hunt for another name started and after a furiously fast search, dip stick studies and feedback sessions, the name Giant Hypermarket was decided upon. The logo design was the same. 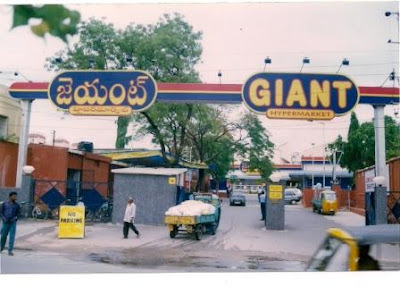 Giant replaced Big and Hypermarket replaced Bazaar. Going forward, even that gave way to Spencer’s Hyper. If you believe in numerology and the original name did not have to be given up, who knows how the Indian Retail landscape would be today! But then, like the famous bard said; what’s in a name, a rose smells as sweet whatever it is called.